Paula’s black and white Sunday this week is ‘Traces of the Past’. “We are but images of stone, Do us no harm we can do nonne”. 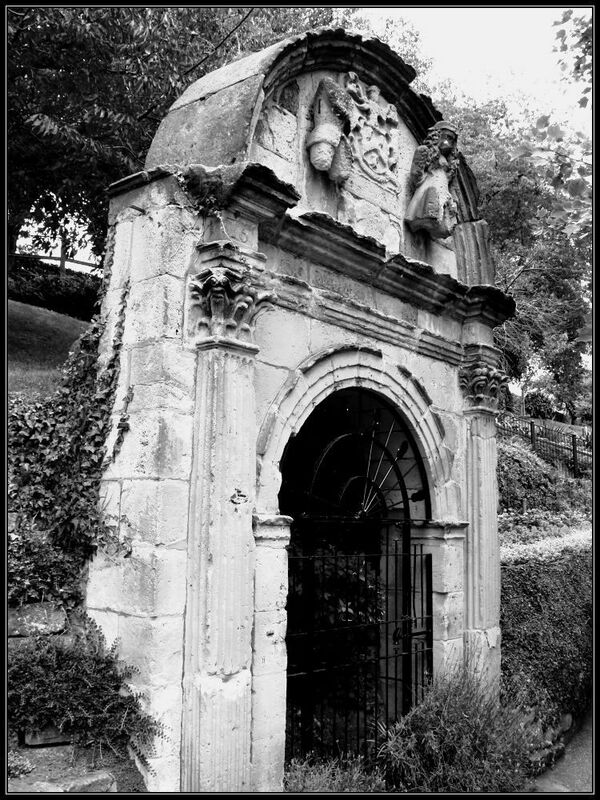 The Shoemakers’ Arbour is found in the Dingle, a former stone quarry and now a sunken garden in the Quarry Park, Shrewsbury. Associated with the pre-Victorian town festival, and originally sited in Kingsland, it was moved to the Dingle in 1879. It dates from 1679 and includes statues of Crispin and Crispinian, the patron saints of shoemakers. The gateway is built of stone, and bears the date of 1679 and the initials, H. P. and E. A.; the wardens of the Shoemakers’ guild at that time. The Shoemakers’ Arbour plays a large part in the song Thomas Anderson by David Harley that describes the execution in 1752 of a participant in the Jacobite rising of 1745. Click on the link for the song and more information about the Shoemaker’s Arbour and the death of Thomas Anderson. Thank you for the link and lesson Jude. I have now read about St Crispin and Crispinian in Wiki. Your treatment of the gate looks just right. I thought it would be nice to use something that is unusual with an interesting historical tale attached. The link in my post leads to a very good article about the Jacobite Rebellion and the death of Thomas Anderson, as well as the song inspired by the article and written and sung by the OH 🙂 I know you enjoy music so you might enjoy it, though I’m not sure whether you like traditional folk songs. Love your photo and contribution this week. Thank you Colline. I have another unusual building in mind for the next one. What a lovely thing, Jude! And the setting looks beautiful. 🙂 I love the idea of a patron saint for shoemakers. Rough old times! Not too very much better now. Fascinating history. I’m sure most people seeing this arch have no idea what it means. I will eventually get around to posting the actual garden in which it stands! Thank you Sue, I thought so too. So often we see this sort of thing and have no idea of the meaning. You’re right, Jude. I would visit this arch and have no idea what it meant. What an interesting history! … and a poem to go with it. I think I will be left with the refrain in my head “Do us no harm. The OH wrote the song inspired by Ron Nurse’s article about the death of Thomas Anderson. A very turbulent time in our history. You do have to wonder what old stones could tell us. Like ancient trees. The OH? you OH wrote the song? I thought it sounded familiar, but obviously not. Have you popped over to his site and listened to it? Yes, it’s fab! Could I have heard it before? Doubt it. Maybe sounds like another trad folk song? Well, I’ve sung it in an awful lot of places. (Also a lot of awful places, but I’m getting over that now.) The tune does borrow a bit from the traditional carol The Bells of Paradise, which Ron used to sing quite a lot. So that might be why it sounds familiar to you. What a time to live in! These stones have a story and I love how you have told it, Jude. I’ve been reading a novel set in Jacobite times – what a terrible waste and such torment for so many. Well the song is all the OH’s so he should take the credit not me. I simply took the photo. I wouldn’t have known anything about it but for him. I’ve just listened to the song in the link. Interesting to hear. Thanks, Jude. I had a listen. Folk music is not really my thing, but I love the lyrics to this song. A nice melange of photos, history, and music, Jude.